An engine rating is primarily limited by structural and thermal limits. These limits include maximum cylinder pressure during combustion, turbocharger speed, exhaust gas temperature and in natural gas engines, fuel type. Where an engine operates relative to these limits will determine the maximum altitude and ambient temperature for a given rating. When an engine exceeds the maximum altitude or ambient temperature, the engine must be derated. 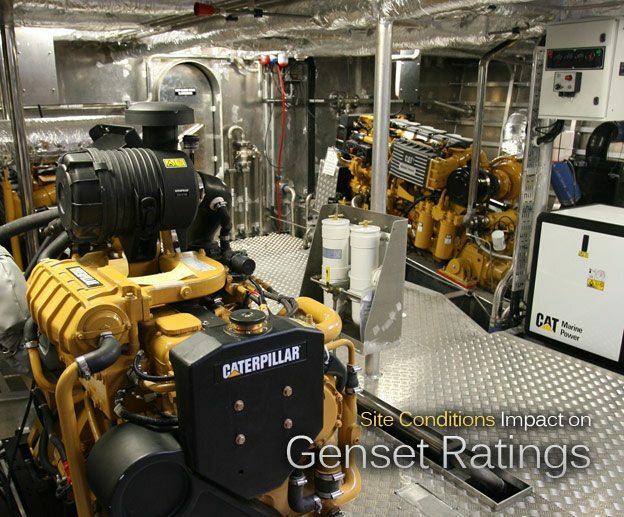 The environment or site conditions also impact an engine or generator rating, thus impacting the rating of the entire genset. Site conditions which may affect a rating include altitude, temperature, corrosive atmospheres, humidity, and dust. Altitude and temperature most heavily influence engine ratings. The higher the altitude, the lower the air density. Clean dense air is needed for efficient combustion. Likewise, an increase in temperature lowers air density. 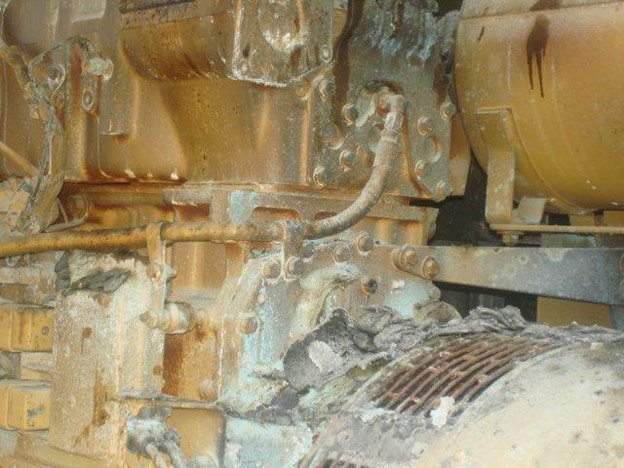 Therefore, a derate of the engine must occur in high altitude and/or high temperature conditions in order for the genset to meet performance expectations. Generators operating at altitudes above 1000 M (3281 ft.) require temperature rise reduction of 1% for every 100 M (328 ft.) above base (1000 M or 3281 ft.). A derate chart is available in TMI for generators and each specific engine. Table 1 shows a sample engine TMI derate chart. *** The powers listed above and all the powers displayed are Corrected Powers. Where the temperature of the ventilating air to the generator exceeds 40°C (104°F), derating of the generator may be necessary. The altitude/temperature derating chart found in TMI can be used for proper derating information. Condensation resulting from humidity will present a problem for all generators unless they are fully enclosed. Temperature rise of the machine and the circulation of cooling air with sufficient load operation will usually prevent condensation. Space heaters should be used to raise the temperature to 5°C above the ambient temperature to prevent condensation in high humidity areas. Filters which fit over the unit’s intake air openings or enclosure ventilation openings can prevent damage. When using filters, it is important that they be regularly changed so as not to impede airflow. The use of a generator air filter will cause the generator to be derated due to higher temperature rise resulting from reduced cooling airflow. Differential pressure switches may be available as an option on many generator sets. hi does the fuel gas manifold pressure and temperature affect derating and maybe I am naïve does the generator winding temps also derate the engine. what parameters continuously affect derating and what are hard written into the operating software. Can anyone share the root cause of overspeed, over heat and coolant leakage from rocker arm gasket. What are the root causes of engine overheat and over speed. Could any one assist me and send mail to bojanolan@gmail.com please…..
can anybody tell me about the selection of cable size. Actually i want to know about electrical designing of cables.